The slideshow should be as shown in the image below. 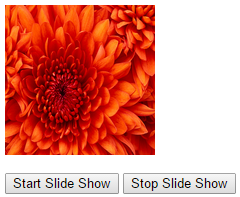 When you click "Start Slide Show" button the image slideshow should start and when you click the "Stop Slide Show" button the image slideshow should stop. For the purpose of this demo we will be using the images that can be found on any windows machine at the following path. Step 1 : Open Visual Studio and create a new empty asp.net web application project. Name it Demo. 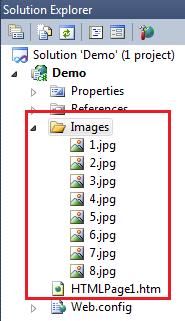 Step 2 : Right click on the Project Name in Solution Explorer in Visual Studio and create a new folder with name = Images. Step 3 : Copy the 8 images from C:\Users\Public\Pictures\Sample Pictures to Images folder in your project. Change the names of the images to 1.jpg, 2.jpg etc. Step 4 : Right click on the Project Name in Solution Explorer in Visual Studio and add a new HTML Page. It should automatically add HTMLPage1.htm. At this point your solution explorer should look as shown below. Finally run the application and test it. I have a question about the slideshow. In this situation we have a static situation with 8 pictures. But in a dynamic situation we have more or less pictures to show. How can you made this slideshow dynamic without recompeling the application? how to handle slide show.